Cooking sous vide at home is something I do about once a week. It's a fun cooking technique that can produce amazing results, especially with proteins. 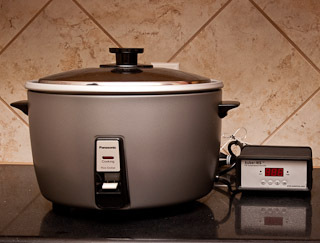 I've tried a lot of different, easy to put together, sous vide cooking setups and personally prefer the large rice cooker with PID controller solution. It's what I use most of the time, and it's given me great results. For people just starting out in sous vide cooking or who want to learn more about how to go about doing it at home, I wrote up a guide to various ways you can do it at home starting with the lowest cost solutions to the expensive immersion circulators. Cooking For Engineers is a finalist in the Whole Foods Market Budget Recipe Challenge! A month ago, I was asked to submit a budget ($4 per serving or less) recipe or meal to the Whole Foods Market Budget Recipe Challenge. At first I wasn't going to do it since it would take me some time (that I didn't think I had) to pull together a recipe for them. A few days later, I decided to do it anyway and threw together a summary of three recipes (Chicken Marsala with Mushrooms, Braised Brussels Sprouts, and Capellini Aglio e Olio) that I would eat as a complete meal. Last week, I found out that I was one of six finalists. Whole Foods also ran a bio Q&A on me if you're interested. I've always used the dry powdered dishwashing detergent. It just seemed more economical and easier (since I didn't have to keep making trips to buy more because each box of the powdered stuff holds more loads than a typical bottle of liquid). So, I've never actually tried the liquid dishwashing detergent until now. I got a bottle of Liquid Cascade and I really like it. We run the dishwasher fairly often (especially when I'm preparing something for an article on Cooking For Engineers or just testing recipes) and sometimes when I'm in a hurry and the box if full, it's easy to spill some of the powdered stuff onto the ground (got to make sure your hands are dry before you try to pick up powdered detergent!). But the liquid stuff seems so easy to pour and control quantity - just squeeze until the right amount is in the cup and you're done! The powdered stuff is a bit harder to control the flow of. 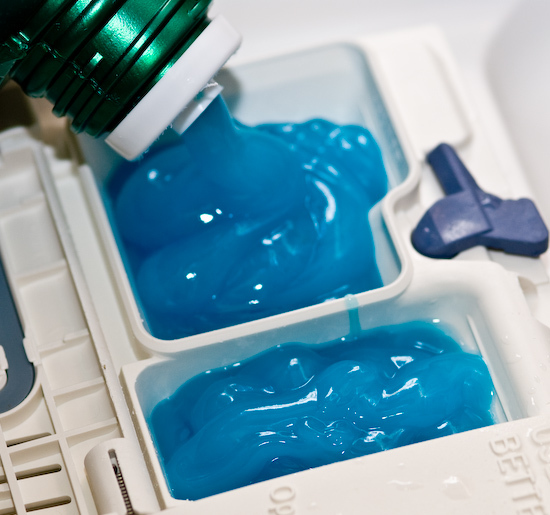 This seems like a silly reason to switch, but after running a couple dozen loads with liquid, I'm seriously contemplating sticking with the Liquid Cascade for my dishwashing needs from now on. Also, I noticed that I don't seem to need a rinse aid anymore - the Cascade seems to rinse of by itself really well even though we've got hard water. 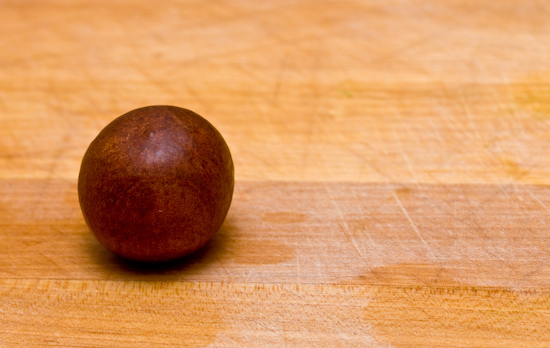 What's Inside An Avocado Pit? While prepping the photos for a Guacamole recipe, I removed the pits from four avocados. It was at this time that I began to wonder what was inside the pit. Was there a nut inside this over sized seed like the pit of a peach, almond, or cashew? I haven't talked much about the preparation of articles for Cooking For Engineers in the past, but I thought this might be of interest to some. Here's a photograph of one of the setups that I used in preparing baby back ribs for smoking. 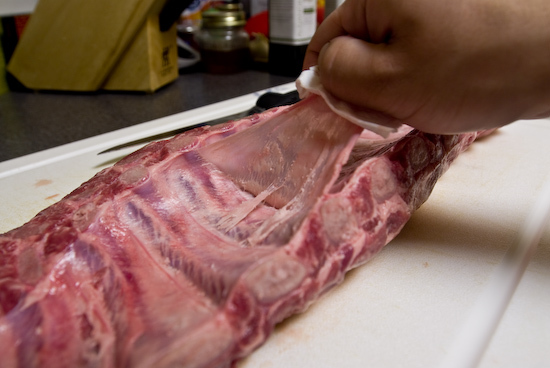 This setup was for a shot demonstrating the removal of the tough membrane found on the back of the rib bones. Occasionally, I get inappropriate comments posted to Cooking For Engineers. This is one I found this morning that isn't really inappropriate, but I didn't feel belonged on the site. I rarely remove posts… usually only spam. Actually, now that I think about it, I'm not going to remove it since I've left far more offensive comments (people cussing about my use of canned cream of mushroom soup, etc.) on the site in the interest of promoting open discourse. Anyway, this was posted to the "oh-so-contentious" Oven Baked Chicken and Rice article. doesnt matter what we eat, it's all about proportions and in moderation. we all know 'fat' tastes good! So, I've been seriously contemplating getting started on the fabled Cooking For Engineers cookbook. With the limited amount of free time I have while working on Fanpop, Cooking For Engineers, and other projects, I imagine the project will take about a year to complete. I plan on doing design, layout, and writing myself so it has the same feel as the website (and hopefully higher quality). John from J.A. Henckels wrote in to let me know about their annual sale at their warehouse in Hawthorne, New York (171 Saw Mill Rd., Hawthorne, NY 10532 - Google Maps). This could be a great opportunity for people looking for Holiday gifts. The sale runs on the weekends (Friday - Sunday) from Nov. 16, 2007 to Dec. 2, 2007. As a lover and communicator of all things food related, I thought you might be interested in this contest from Tools of the Trade. We are offering US residents 18 and older a chance to cook side-by-side with celebrity chef and cookbook author Dave Lieberman. Just as Hollywood has the Oscars, TV the Emmys and Broadway the Tonys, the publishing world has the Quill Awards. The Quills celebrate the best adult and children's books in 19 popular categories, ranging from cookbooks to biography and children’s books to general fiction. The Quills Selection Committee for these 19 categories chose books that have received a starred review in Publishers Weekly and have held a position on the Publishers Weekly Bestseller List.